The Third Chimpanzee: The Evolution and Future of the Human Animal. New York: Harper Collins Publishers, 1992. First edition of this early work by the award-winning scientist. Octavo, original half cloth. 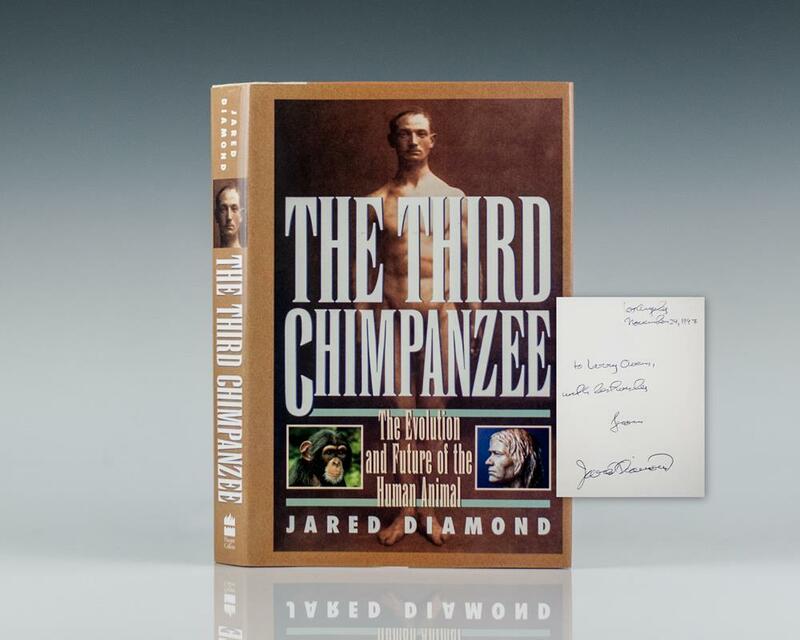 Presentation copy, inscribed and dated by Jared Diamond on the front free endpaper to noted book collector Larry Owens. Fine in a fine dust jacket. "Jared Diamond conducts his fascination study of our behavior and origins with a naturalist's eye and a philosopher's cunning" (Diane Ackerman). "The Third Chimpanzee will endure" (Edward O. Wilson). First edition of this early work by the award-winning scientist. Octavo, original half cloth. Association copy, warmly and lengthily inscribed by the author to fellow writer Peter Matthiessen on the front free endpaper. Fine in a near fine dust jacket.